Stone’s Flow – Author Ronald Moger: Dark tales, cynicism, humour. Out from the mists that surrounded Stone’s Flow rode eight horsemen. At their head was a recruiting sergeant. He called for all men of age to step forwards and to fight for the South. John Blenny was 17 and, with his mother, Hannah, gripping at his arm, he stayed back as he watched his friends and kin gradually step forward over the hours, fetching what belongings they could take, kissed their loved ones goodbye and headed off to fulfill their duty. As they followed the horses out of the village, the mists swirled and embraced the men one by one, until only a wall of twisting grey remained. The village had been struck by a pox only a year before, brought by a visiting cousin, the children quickly became feverous and, one by one, perished along with some of the menfolk. Two miscarriages had ensured this generation was not to continue and many feared for the future of the settlement. Now the remaining men were being taken away, a final nail in the coffin, it seemed. The mists stilled. A silence descended on the village, what was there to be said? One by one the womenfolk went back to their homes and duties. John stared out towards the woodland, felt again the tug of his mother’s hand, and went back to the house. The work would not do itself. Evelyn had known John for always. Everyone in the village of Stone’s Flow knew each other, but Evelyn knew John especially. She had watched him when they played as children, his hair curling up over his collar. She had watched when he first went into the fields with his father and had slipped in the dirt while trying to push the plough. She had watched as he stood by his father’s graveside, the preacher casting handfuls of dirt onto the coffin and John had shed only a single tear. She had watched as he turned into the house instead of going away to fight, and she had been able to breathe again, knowing that for now at least, he would be safe. Not long afterwards, Hannah was struck by a fever and, despite John’s best efforts, she passed and was buried in the churchyard alongside her husband. Evelyn had stopped by to help with the house during these hard times and, as youngsters do, John and Evelyn grew affectionate for each other. They would have chosen a better time to be together, but decided to see it as a gift from God and were married soon afterwards on John’s eighteenth birthday. They moved into Evelyn’s house as it had better stabling and decided to sell John’s childhood home as soon as the war was over. John worked the fields with his horse Firefly while Evelyn kept the house, they had simple needs and wanted for nothing. Each morning Evelyn brought John food and, as she walked away, he never tired of watching her golden hair catch the sunlight, or of her loving look as she smiled over her shoulder at him. The war, however, still thirsted for more soldiers and, soon enough, now that John was of age he was called up to fight in his local regiment. He gathered what belongings he could, kissed Evelyn goodbye and swore he would return to her, no matter what might pass. 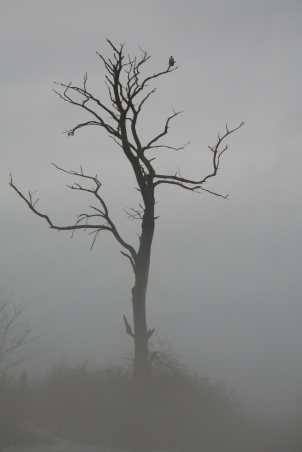 Evelyn stared emotionless as he walked off into the mists, and was gone. The weeks following were hard. She knew nothing of the fields and, with no men about, the village slowly began to fall into disrepair, but the womenfolk got by.They looked out for each other and nobody wanted for food or warmth. They even set aside enough to have a harvest festival and danced and, for a short while at least, forgot the tragedies that had befallen them. The next morning, things changed. A rumbling could be heard from across the hills, a murmur at first, but then loud enough to awaken the villagers and to know that something was coming and, without speaking a word to each other, somehow all new that a testing time was headed their way. Panic gripped the animals of the village, Firefly particularly kicked and started within his stable, breaking free of the ropes that bound him and smashing threw the doors, he ran out and bolted into the woods away from the sound. The mists swirled, and in rode a score of battle worn and bloodied union soldiers on horseback. Their uniforms were muddied and their faces wore the emotional badges that only warfare can award. Their eyes had the humanity taken from them, and they would give no pity nor charity to any who crossed their path. “Sergeant, secure the church and find stabling. Corporal McLellan, fetch supplies from the stores, the rest of you make camp in the churchyard, we’ll stay here and move on in the morning.” The Captain moved slowly and deliberately forwards, he eyed the women as they rushed out to see what was unravelling before them, he saw Evelyn particularly. Her hair caught the early morning sun, her face, although a little swollen from the night’s air, still showed her natural beauty and he noticed, as men of his type were wont to, her figure beneath her night gown, flowing downwards but out over her womanly hips. He had been among the filth of the battlefield, the ground had run with the blood of his men and the previous years had sapped away any elements of humanity that he might once have had. He could no longer be called a man and cared nothing for other people’s wishes. He was going to take her, no matter what. As the villagers tried to carry out their normal daily work, the men raided the stores to their own satisfaction, taking all the liquor that had been stored away for Christmas and packing their horses with ammunition and dried goods. They had no intention of recompensing the locals for their losses, and no-one was to ask them for anything as any communication might have brought danger to them all. It turned out that their caution would only delay, not stay, the inevitable actions of their visitors. As the liquor slowly drained away, so did the men get louder, rowdier, more volatile and unpredictable in their actions. They kicked at the women rushing to their homes from the cattle sheds and laughed as Evelyn, carrying what piglets she could to her home for safekeeping, slipped in the mud and fell to her face to the squeals of the piglets and the drunken soldiers. The captain sat in the churchyard by his tent, bottle in hand, and said nothing. He just stared. All went to their houses and battered down their hatches in a token attempt to keep themselves safe from danger, but as one o clock in the morning passed, these minor defences would prove their worthlessness. Evelyn was awoken by a shrieking on the far side of the village, and then another in her neighbour’s parlour, continuing to the street. Panic. She had no time to consider where her rifle might be, the door blew open with a smash and the Captain marched in, bottle in hand, and dragged her off to his tent, and her fate. There was no point in discussing what had happened, the women walked, broken and drained, back to their homes. Their eyes were soulless, their bodies broken, their spirits crushed and cast aside. This was what war had brought to them. Village life is regular with a predictable monotony, and this is exactly the routine that the women of Stone’s Flow fell back into. There was no need for meetings, no need to reach out to the world, it would do no good, and who would listen? The world apparently had troubles of it’s own. The war continued, but no news of it reached the village. Their lives descended into the grey. Two years would go by before the mists would part again, a wanderer returned. Out of the woods walked John, now twenty years old, not just a man but a man of the world. He had fought through as best he could, one bullet had taken his cap and another passed through his shoulder but a slap of the iron by a quick thinking field surgeon had cauterized the wound and no infection had taken root. His company had been decimated and, although he had to return to the front within the week, he looked forward to sleeping in his own bed again, washing his body with fresh water from the stream, holding Evelyn, if only for a short while. The village was silent, the women peaked cautiously at John through the shutters as he walked down the centre road. Although two years had passed, the broken bottles remained strewn about the place, the church door left open with no pastor to put things right. It was not the place he had grown up in, and loved, and gone away to protect. “Fight there so we don’t have to fight here”. Evelyn stepped out of the house, John approached the porch and, without saying a word, he stepped inside, Evelyn followed. His kit hit the floor, his boots came off, and they both lay down on the bed, staring, and then sleeping. The fields were in danger of falling fallow. A man’s work continues, and duty is duty. The plough had not seen work these past years and was in danger of falling into uselessness. A sharpening stone and some hard work, and the plough was back to a good state. The morning was crisp and fresh, but not so cold that a man could pretend that a field would not need working. But there were no horses, not even cows to pull the weight. John called, and again, and then a whistle. Slowly, Firefly cautiously stepped out of the woods. A second whistle and, pricking up his ears, Firefly ran with abandon to John, letting him groom him with his hands. He had survived, somehow, but was wasted and his ribs and hips were visible. This pained John but work had to be done, he fed Firefly with what grain he could find and, after a drink from the stream, put him to work in the field. The straps around his head had rotted with damp and had to be replaced with what rope John could find, it would hurt the horse if he used it for too long, but with good breaks from time to time, he felt it would have to do. By now the womenfolk had gathered in number and watched as John went up and down the field until Firefly frothed at the mouth with exhaustion, it would be enough for this one day. Evelyn watched as John led him to the stable, she was sorry that she hadn’t looked after him properly in those early days, but was glad that all had worked out for the better. Firefly would be ok and, more importantly, so was John. On the third day of field work, there was movement in the village. Union soldiers had returned and the womenfolk were nowhere to be seen. As the Unionists went from house to house searching for provisions, John quietly loosened Firefly’s harnessing and sent him into the woods. There was a rifle at Evelyn’s but he was out in the open. The only way to it was through the mists and round the village, arriving there at night while the soldiers might be asleep. Twenty men had ridden into Stone’s Flow those years before, now only eight remained, apparently having deserted these past years and survived on the spoils of their deeds. Night fell, and John stole his way into Evelyn’s house. There she was, silent and watching, as John found the rifle, loaded it, and with extra ammunition crept out into the night. The first soldier, a drunken sentry, fell to John’s knife. A second to a rifle shot which alerted the others to his presence. They swiftly gathered and headed towards the sound of the firing. John went back towards Evelyn, and waited. No lights inside gave away his presence and an open side window gave him a clear sight of all the men as they slowly, foolishly, made their way in a line towards him. Unexpectedly, they stopped. The women looked on, Evelyn waited, John, cocked his rifle. A bead of sweat ran down John’s forehead, he wiped it from his eyes and steadied his now shaking aim. John paused, Evelyn had been everything to him.Two years of fighting had told him that conversation meant death, he fired a bullet straight through the Captains forehead. His men’s horses jolted as John fired again and again, reloading, and then heading out of the building and taking good aim at the now fleeing Unionists. One by one he picked them off, one by one their blood ran into the mud of Stone’s Flow. The next morning, John dragged the soldiers’ corpses to the churchyard. There, inside the church, he founded the piled corpses of the women. Long dead, but bloodstains on their dresses and undergarments were still distinct. Rings on their fingers had been ripped away, some fingers removed where they would not give easily. In the middle of the pile was a mop of matted but still golden hair, there lay Evelyn. John had heard of the icy steel of the bayonet, how it felt to those who had survived it, he remembered how the bolt of the bullet hitting his shoulder had felt. He had felt the shockwaves of exploding cannonballs. All this was nothing to the wave of coldness, utter grief, it sucked all energy from him and he fell to his knees, crying so hard that no sound came out. He put Evelyn’s hair to his cheek and sobbed a stream, a river, a torrent, until he passed to sleep from being drained so hard. The next morning, John dug a pit and threw in the soldiers’ bodies. Throughout the day, he dug graves, shallow as they were, for each of the women and erected a cross for each. He dowsed the soldiers in the remaining liquor and cast a match on them. Lastly, he carried out his Evelyn, sweet Evelyn. He laid her in a sheet, kissed her good night, and wrapped her bound. As he slowly shoveled the earth onto her corpse, a single tear ran down his cheek, he swept it aside, and rammed home a cross to her pathetic grave. Out of the mist stepped Firefly, somehow he had sensed that John now needed him again, and John, stroking Firefly’s nose and taking the rope harnessing from his head, climbed up to ride into the mists, rope in hand. The grey wall enveloped them as the bodies burned behind them. Evelyn stood waiting, John walked out of the mist and they rushed to each other’s arms. The women looked on as the young lovers held hands and walked into the house, together away from the dangers. John was home at last.